La Quinta, the Gem of the desert. Welcome to La Quinta Real Estate where you can access all La Quinta homes listed on the local MLS. Below is a sample of available properties and you can find many more by following the City of La Quinta real estate link at the top of the page. If you have any questions or would like to set up a private showing, please contact us online or give us a call at 760-285-3578. La Quinta California, also known as the “Gem of the Desert”, is a vibrant community located on the eastern side of the Palm Springs Valley. La Quinta attracts full-time residents, businesses, and vacationers alike. With its stunning location nestled at the base of the Santa Rosa Mountains, perfect weather, thriving businesses and recreational opportunities, La Quinta is a major desert destination. 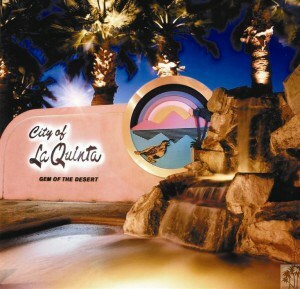 La Quinta is known as our “youngest City”. There are many newer homes, and because it’s right next to our rural end of the valley, it’s got a wide-open feel to it. La Quinta is proud to be home to some of the best golfing communities in the world, such as The Madison Club, The Hideaway Club, The Tradition Club, Andalusia and many more. La Quinta offers tennis, loads of hiking trails, equestrian stabling and events, bicycling, or swimming. La Quinta also offers it’s unique walking or riding trails along side many of it’s streets. World class events are held every year in La Quinta, such as the Humana Challenge (formerly known as Bob Hope Chrysler Classic), La Quinta Arts Festival, Farmers Markets, International Polo and Jumping Competitions, and the Indian Wells Tennis tournaments. Old Town La Quinta, located adjacent to the historic neighborhood of the La Quinta Cove, and a short golf cart or bike ride from the La Quinta Hotel & Spa, offers a quaint village atmosphere. Offering a variety of boutiques, shops, restaurants and cafes, including the “local” coffee spot. It is the perfect setting for many seasonal activities, farmer’s market, art shows and outdoor concerts. If you’re looking to wind down and spend some time in a relaxed environment, come on down to Old Town. La Quinta provides both public and private school opportunities for grades K-12. Desert Sands Unified School District headquarters are located in la Quinta. The College of the Desert and the combined campuses of California State University – San Bernadino and University of California – Riverside are nearby, making quality higher education opportunities readily available. There is so much to love about living, working and vacationing in La Quinta. If you’re looking for an excellent quality of life overall, La Quinta is the place for you !! !